KBS’ “National Song Contest,” which has been broadcast for 34 years, is the longest-running TV program in Korea. It was the first singing audition program open to the public. The contest has visited every corner of the country, attracting more than 10 million people to spectator seats. Some 85,000 people from all walks of life, including migrant workers and immigrant wives, have auditioned, and 30,000 of them have qualified to appear on the show. Its opening theme song is all too familiar to most Koreans, including the artist Byun Soon-cheol. On a typical Sunday morning, the program struck him as an interesting photographic subject. He had mostly taken portraits, focusing on diverse aspects of everyday life. “I saw Korea in the contestants’ faces,” said Byun, whose exhibition of photographs of contestants and spectators of the program opened on Tuesday. Some 40 works are being showcased in the exhibition at the Buk Seoul Museum of Art in northern Seoul. The contestants he took pictures of make exaggerated gestures and wear loud stage costumes. An owner of a small restaurant serving spicy chicken feet in Sokcho, Gangwon Province, wears a glittering blazer and impersonates a pop singer. 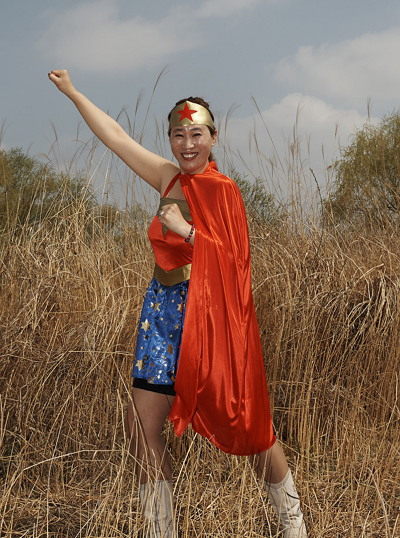 A female contestant is dressed like a cartoon character and gestures as if she’s about to fly from a reed field in Osan, Gyeonggi Province. A housewife, a 70-year-old man and a young aspiring male singer are overenthusiastic about showing their best to the audience and judges. Byun has captured striking features of the contestants that reveal their long-cherished passion to sing and dance on stage. The exhibition “The National Song Contest” continues through Jan. 5, 2015, at Buk Seoul Museum of Art in Nowon-gu, Seoul. For more information, call (02) 2124-5270.